You are currently browsing the Wildlife Photography in Thailand and Southeast Asia blog archives for June, 2011. 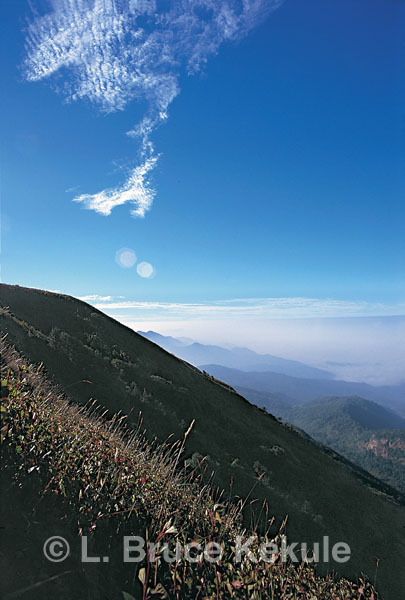 For centuries, northern Thai people called them ‘angel horse’ or ma tewada referring to angelic creatures living on mist-shrouded mountains. Goral are even-toed ungulates of the bovid family that includes pig, deer, goat and antelope. They are one of two goat-antelope species found on forested peaks and limestone karst formations that jut from the landscape. The other goat-antelope is the serow, a larger bovid but found throughout the Kingdom from the north to the south, and east to the west. They mingle with the smaller goral at some locations in the North, primarily in the protected areas. Goral, on the other hand is found only from Tak province up to the border of Burma on the western flank. Photographing endangered wildlife species has become a bit of an obsession to me. Many of Thailand’s animals have come so close to extinction that their numbers are not counted in thousands or even hundreds but mere handfuls at some locations. Both species are extremely endangered especially the goral. 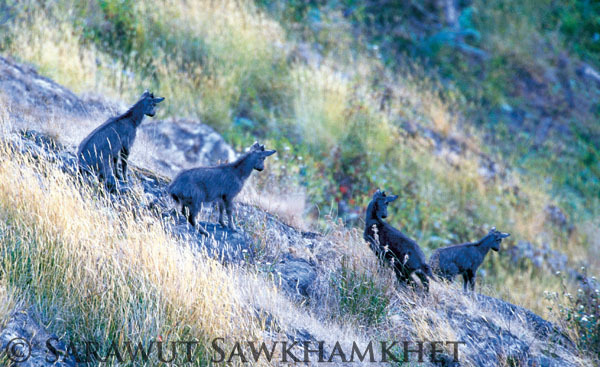 I have photographed goral and serow in their environment but it is fraught by danger due to the sheer cliffs and rocky terrain where they live. On some tracks, one miss-step could end up in disaster. Goat trails worn over thousands of years are engraved on steep mountains throughout the country even though most of these bovid have disappeared from the habitat. Unfortunately, protection and enforcement came a bit too late! But the evidence of their past existence still remains. Over the years, I have walked these deeply rutted tracks in the North. At one time, there were absolutely thousands of these goats in the wild. The estimated population of goral in the country is now about 200-300 individuals based on several recent surveys carried out be the Department of National Parks (DNP) where the goats remained. Some fifteen years ago, only 60 were documented in 6-7 protected areas. 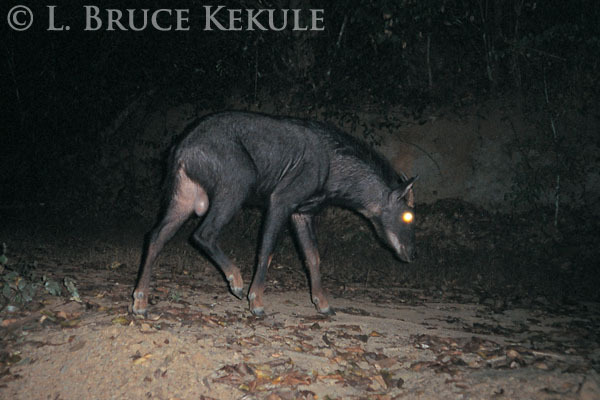 Goral are now found in 19 sites as follows: Mae Ping, Doi Inthanon, Ob Luang, Pha Dang, Doi Fas Hum Puk, Namtuk Maesurin, Tumpla-Namtukphasuay, Sisatchanalai, Doi Jong, Sri Lanna national parks, and Omkoi, Mae Tuen, Salween, Chiang Dao, Mae Lao-Mae Sae, Doi Wing La, Doi Luang, Sun Pun Dang, Lum Nam Pai wildlife sanctuaries. 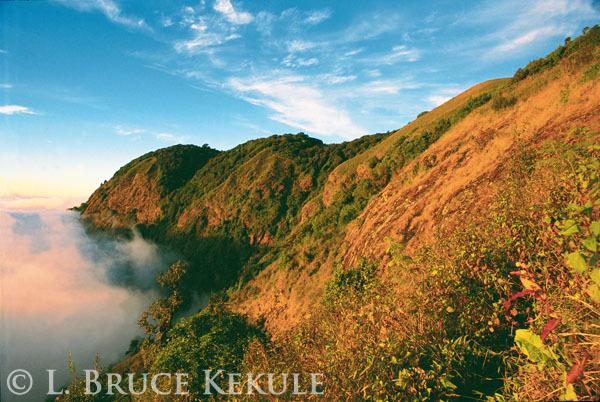 In Mae Lao-Mae Sae Wildlife Sanctuary, goral still thrive on Mon Liem, a massif some 1,200 meters above sea level. 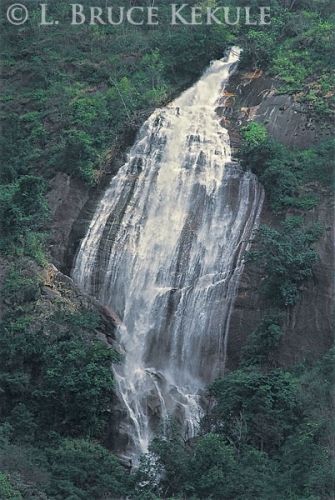 This protected area is about 80 kilometers northwest of Chiang Mai and cover an area of 514 sq. kms. The headquarters is situated on Route 1095 about halfway between Mae Malai, a small town north of the provincial capital to Pai in Mae Hong Son province. 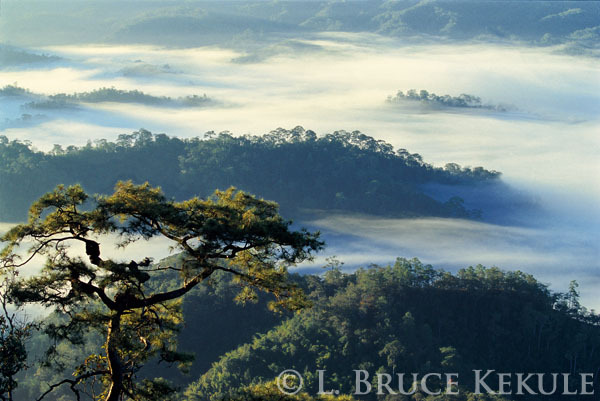 Another great place for these amazing animals is Doi Inthanon National Park some 80 kilometers south of Chiang Mai. It is Thailand’s highest mountain and protected area at 2,565 meters above sea level covering an area of 482 sq. kms. 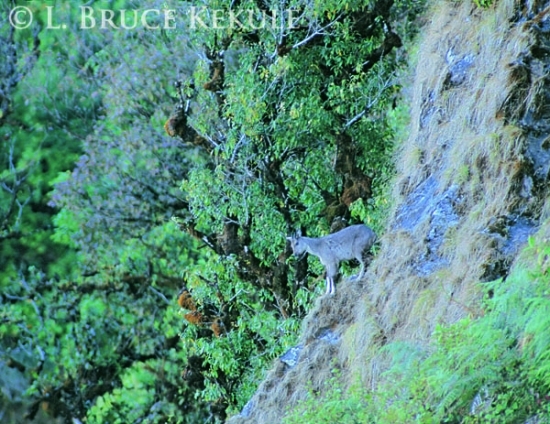 Both species still thrive on the rocky slopes but are persecuted by low land people and numbers remain very low. 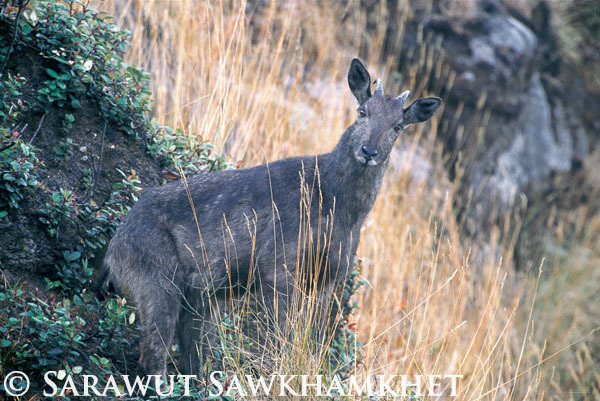 Goral and serow are creatures of habit and have places where they stand in the sun during early morning or late afternoon usually on a rock or grassy mound. They can remain motionless for hours on one spot as I witnessed in Doi Inthanon. A male goral stood from about 9am to almost 12-noon as I sat in a freezing blind at 2,350 meters. The temperature here can drop to zero degrees Celsius during the winter months. Another habit is to defecate at the same place. Piles of pellets are found wherever they live, usually below a large rock. They also move around and have several sunning locations especially when they have been disturbed. They are extremely shy of humans and will disappear into the rocks at first sight. These remarkable animals can navigate vertically up or down and latterly if need be, and get most of their nourishment through the vegetation they eat. During the extreme dry season, these goats will seek out a stream or mineral seep for moisture. 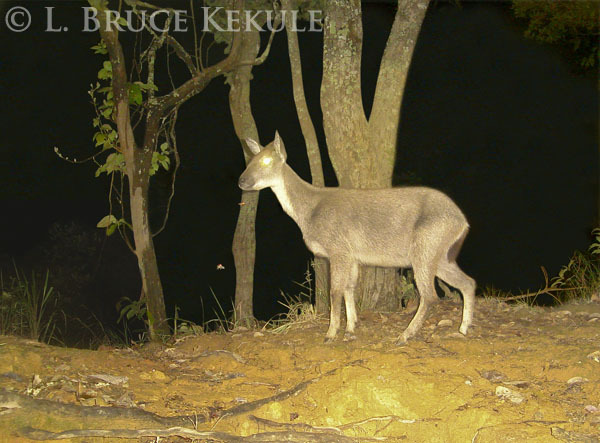 Mahidol and Kasetsart University (Bangkok) students and professors studying the impact of human settlements near goat habitat, and surveying the remaining wild population have carried out some research on both species. Unfortunately, goat numbers remain very low at all locations, especially the goral. Dr Rattanawat Chaiyarat and the late Dr Choomphon Ngampongsai with Kasetsart University, and the late Seub Nakhasathien, the famous conservationist with the Royal Forest Department, were the first people to study goral. Dr Vijak Chimchom with Mahidol did his MSC thesis on serow in Sam Roi Yot National Park down in Prachuap Kirikhan province along the coast in the Gulf of Thailand. Both species have been hunted for their meat, horns and oil that come from boiling the head and bones. Supposedly, this oil is used to relieve arthritis and other bone ailments but this is very doubtful. 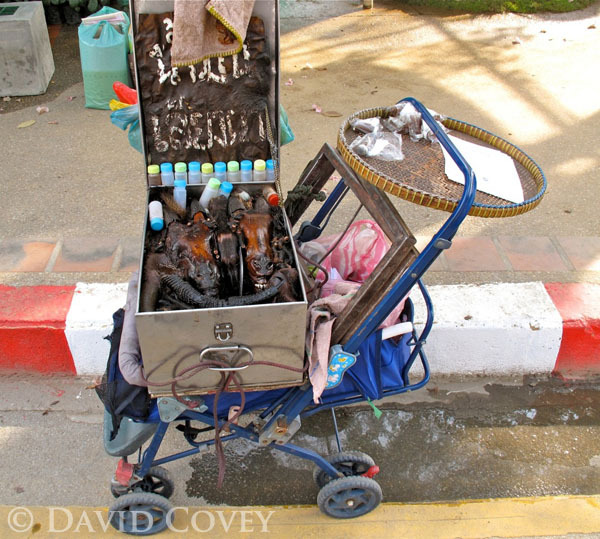 A man in Chiang Mai pushes a cart around the city with two serow heads in oil selling this so-called remedy seen in the accompanying photograph. The horns of goral and serow are black, corrugated at the base, very pointed and swept back (like their relatives, the Rocky Mountain goat of North America). Their horns are not impressive but are still sought after by poachers. 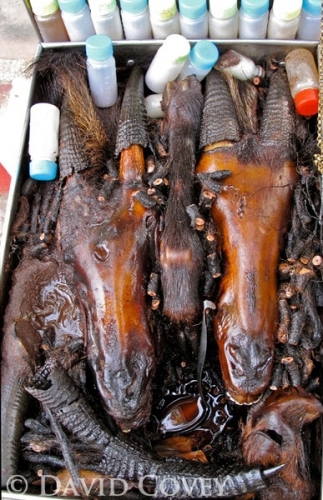 The tip of serow horn is used to make deadly knives that are attached to a rooster’s spur used during cockfights, primarily in the South. This large ungulate is eagerly sought after wherever they survive. The Hmong ethnic people hunt the goral just before their new year in February and believe eating the meat will make them strong. This has brought the goral near to extinction in northern Thailand. Over the years I concentrated my photographic efforts on Doi Inthanon. 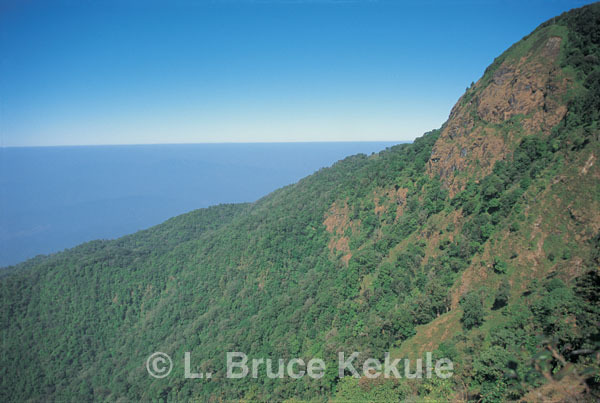 In 2003 after consolations with Anusit Mathavararug, the superintendant of Doi Inthanon at the time to arrange a photograph trip after both species at the cliff-face and made four different trips to the park. On the last day, I got lucky. On a wind-swept ridgeline, with the temperature hovering around zero degrees Celsius (32 Fahrenheit), I huddled in a small shallow depression early one morning in January. A camouflage net was propped above me by some poles and string. It was freezing cold and my feet felt like two frozen rocks, but my body and head were well covered and warm. Several local Hmong (former poachers) helped me get close to goat habitat. The sun was up but still low on the horizon, and the surrounding light was magical. I waited patiently to see and photograph these elusive creatures. 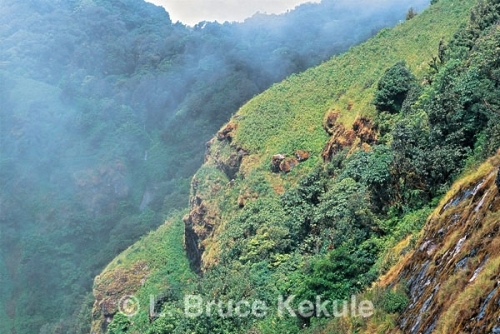 As I scanned the opposite cliff-face for movement, I heard a strange sound about 15 meters below me, off to the side. At first I was not sure what it was or where the sound was coming from. Then I saw this little creature snorting and stamping its feet at me. I was an intruder in the kid’s territory and presumed that the youngster’s father and mother had probably been scared off by my scent. Over hundreds of years, these remarkable ungulates have learned that man is to be avoided at all costs. Then the little goat climbed up and was standing diagonally across from me but still kept its distance as featured in the lead photo. In the meantime, I kept shooting my camera and had to reload film. I was having a great time photographing this young innocent creature. After a few minutes, it went back down and finally disappeared into the alpine brush leaving me awash with joy. 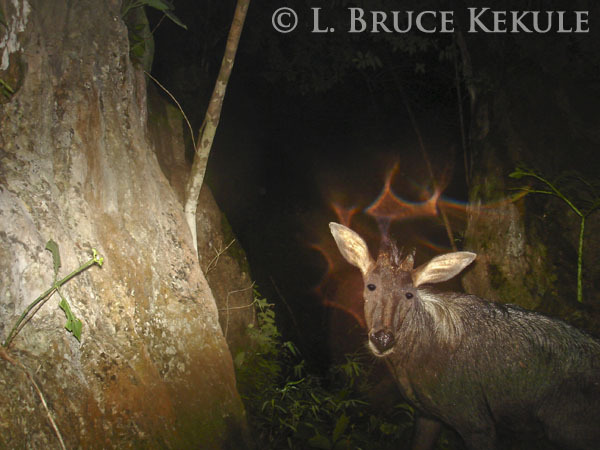 Getting that close to one of Thailand’s rare mammals was well worth the effort. All the hardship of camping out in the cold windy and wet conditions, getting up at 4am and walking a kilometer in the steep slippery dangerous terrain disappeared from my mind. The brief encounter is etched in my memory of what innocence in nature really means. After my success, it became widely known that goral actually did survive out on the cliff in Doi Inthanon, and several other wildlife photographers visited the wind-blown slopes seeking the goats. My good friend Sarawut Sawkhamkhet has made many trips over a three-year period to this place. Most of the time he saw nothing except cold rain and fog. But he has been lucky too photographing a mature goral up close and on several other occasions, a herd of goral; which shows diligence does pay off when one is consistent. In the old days, I also visited Mae Lao-Mae Sae making several trips up the mountain. Evidence of a few goral was about and sightings were always brief. Recently, I was invited by the chief Romyen Thongsibsong and my close friend Dr Sawai Wanghongsa to visit the site again to carry out a camera-trap survey. 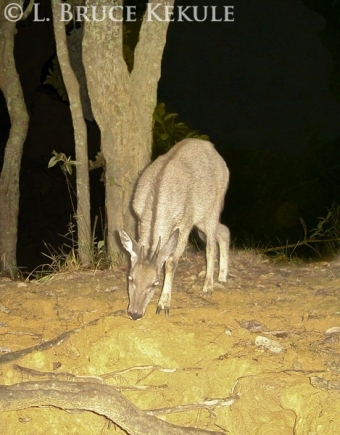 On the very first two-week stint, an old male goral with a broken horn was recorded on one camera shown in this story. A wild pig and piglets plus a large Indian civet were also caught by camera-trap up the mountain. 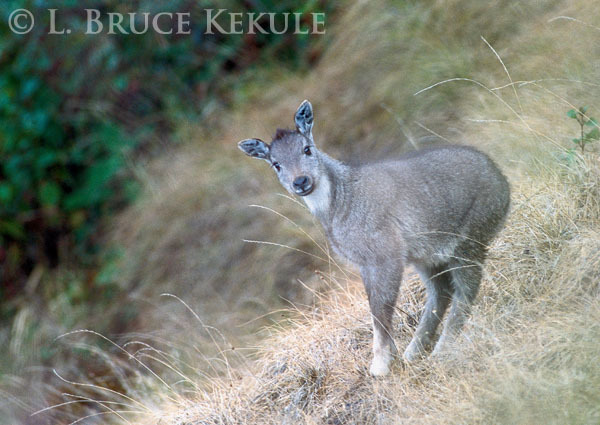 In August of this year, the DNP will reintroduce nine goral from Omkoi Breeding Centre into Mae Lao-Mae Sae. A corral facility was erected in the wildlife sanctuary many years ago to accept wild animals saved from poachers and other people who kept them illegally, but was never used. The fenced-in area is about 2 sq. kms. and is now separated into three zones where three goral will be kept in each zone. Six will be collared and a research team headed by Adisorn Kongphoemthun will look after and monitor the animals eventually releasing them into the sanctuary. Another team headed by Somchai Borisoothi from the Chiang Mai Wildlife Education Centre at the Doi Suthep Non-Hunting Area, will conduct ‘Out-reach’ workshops in the area. They will coordinate with the locals teaching them wildlife conservation, and the importance of saving the goral and other animals in the sanctuary for the future and their name as a conservation village. Protection will be up-graded to look after this project. Hopefully, this can eventually turn into an eco-tourist attraction where people can visit the sanctuary in the morning and evening, walk a nature trail and then view the goats out on the rocky cliff-face. The money can then go to the rangers for up-keep and patrols. 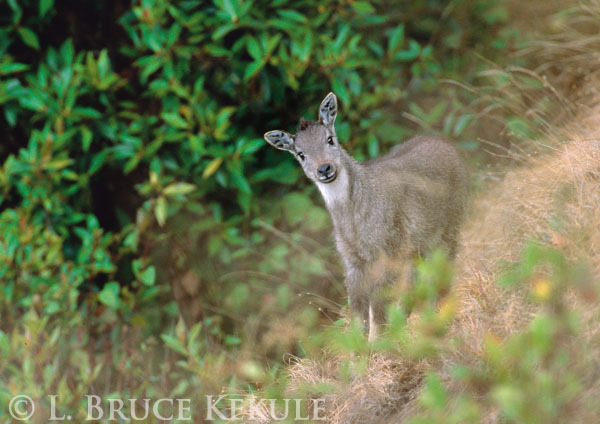 It is great news that the DNP has taken the initiative in this reintroduction effort to save the goral. Other locations and other animals in captivity should also benefit from a program like this. At the forefront are increased protection and enforcement plus more funding and new personnel to help the rangers patrol the forests. Incentive for these people is imperative. I hope these photographs and story will instill a sense of awareness, so the powers that be will look after these magical places. The people of the present and future need to see these wonderful animals, and be reassured that the ecosystem is still intact and truly worth saving.